Round trip transfer (round-trip) from the Lobby of your Hotel or meeting point. Water, soft drinks and light snacks. All the equipment needed to do the activities. 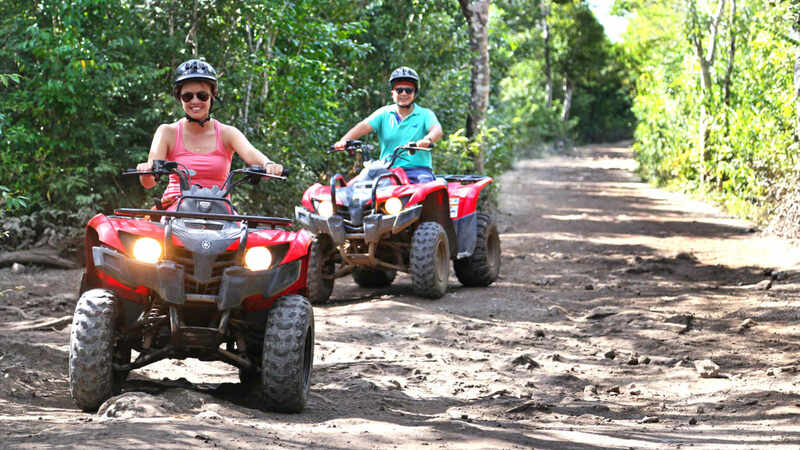 Arrival route of Adrenaline, where you can perform the following activities: 60 min of ATV´S (20 KM). 2 Tyrolean wall rappelling Ceremony Maya (10 min). Want to live an adrenaline adventure? Come and enjoy activities such as: ATV´S, wall rope, rappel, snorkel in underground river and discover a Mayan ceremony that has prevailed throughout history. Pick Up: 7:20 a.m. y 10:20 a.m. Applied Pick Up in all hotels in Playa del Carmen, Riviera Maya and Tulum, when limited access is defined meeting point (will be informed in advance). Biodegradable sunscreen. Insect repellent Biodegradable. It is very important to note that this tour cannot be performed with pregnant ladies or people with back problems. $ 91.00 Juniors 6 - 11 Years. Free, Infants under 0 - 6 Years.